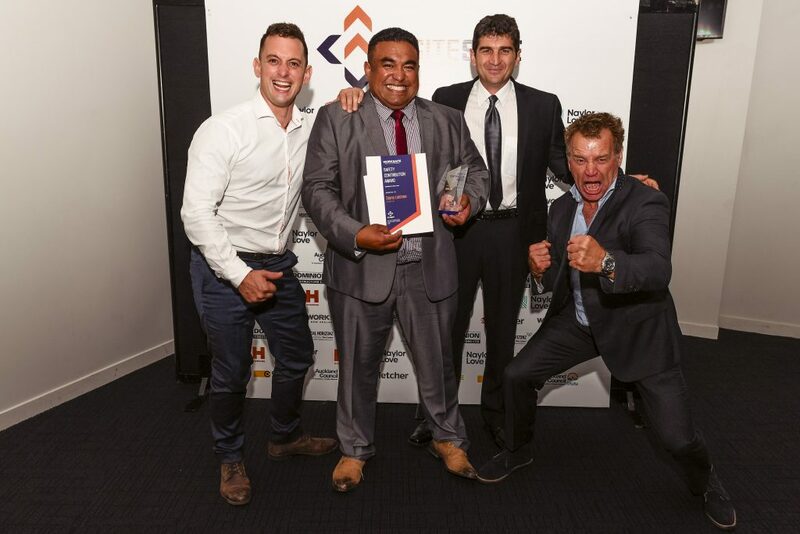 Sione Lolohea – WorkSafe Safety Contribution Award for leading and inspiring a dramatic culture change at APS Ltd.
After an early near miss, Sione has gone on to pave the way for a raft of improvements in the company’s safety culture, bringing a new level of realism and connection to the team’s height training. Sione has been instrumental in developing new safety products, including design improvements to roof anchors and APS’ PPE safety kits. Monadelphous Engineering – Vertical Horizonz Safety Innovation Award for large businesses for their innovative pipe compaction frame. The frame removes the need for operators to work in the trench, eliminating the risks of engulfment, noise and manual handling. The frame has also significantly improved the rate of compaction, bringing substantial productivity gains. Pipeline and Civil – Teletrac Navman Safety Leadership Award for their leadership-led approach to health and safety culture. The judges said “the dedicated and hands-on approach to health and safety shown by the management team at this small business is truly impressive. Led by its directors and managers, Pipeline and Civil have made a raft of improvements to their health and safety. Leaders at the business have led by example and demonstrated their care by being on site with workers to review safety processes and procedures. Spiral Drillers Civil – Hawkins Safety Innovation Award for small to medium organisations for their clever rock core removal tool. This year Site Safe had a record of more than 320 graduates, many of whom attended the official graduation ceremony at Alexandra Park. By participating in a range of Site Safe courses, students earn NZQA credits towards the Certificate in Construction Site Safety qualification, which leads to lifelong learning and the development of leadership skills in health and safety.